I read this post by Erin Loechner, who writes the blog Design for Mankind, last week and have been thinking about it ever since. When I first started blogging, I did it sporadically and unintentionally. I didn’t schedule time to blog or seek out inspiration per se. I would blog when I felt like it, when something interesting hit me, or when I happened to capture a photo of something I made at home or ate out. This was before Pinterest and Instagram and Twitter (but not Facebook). Before I owned a fancy camera or even an iPhone. I wasn’t a blogging pioneer (though I did have a LiveJournal back in 2001) but I definitely remember a time when blogging was still something few people did, and even fewer people did professionally. I started blogging because I missed writing and as I was discovering my new surroundings in San Francisco, it made sense to tie my ramblings to food. My photos weren’t pretty and I’m not sure that at the time, I actually cared. I photographed food in dim restaurants, used flash, and my only props were my regular utensils and, occasionally, a placemat. By the time Matt and I started Turntable Kitchen, I had accumulated a large selection of napkins, twine, mismatched plates and vintage utensils. I began to have a schedule (Monday, Wednesday and Friday posts, regardless of whether I was inspired or not). Like many writers, I had been taught that in order to become a better writer, you had to write more. And you had to schedule an allotted writing time for yourself, even if you weren’t specifically in the mood to write at that moment. For the most part, it worked. I cooked more, I photographed more, I wrote more and in turn, I became a better cook, a better photographer, and (I hope) a better writer. But at some point, blogging became more than just writing; it started to feel like keeping up with the Joneses. In addition to photographing our recipes for the site (and later the Pairings Box) I started photographing using my Instagram account. I signed up for a Pinterest account and immediately began comparing my images to those of others — many of which were taken by professional photographers…people who style and photograph for a living. The more I got sucked into Pinterest, the more I started feeling inadequate in other parts of my life; were my dining room chairs unacceptable? Should my flower arrangements be tied with twine and sweetly tucked into mason jars? Were my new Fall boots already last year? I began to feel overwhelmed by the amount of ‘stuff’ associated with getting the word out about my posts: stumbling and pinning and tweeting and Facebook-ing. Even though I was still sharing the food we cooked and ate at home, I began to think more strategically about what would be popular. There is nothing wrong with this way of thinking, and frankly, I think it makes for a better reading experience. But, between the increased flow of craft and cooking projects I was seeing on Pinterest, the amount of blogs I was reading as a result of being so active in social media, and the amount of time I was spending thinking about how to tie my posts to relevant events, I had little time to think about the thing that was at the heart and soul of what I was doing: writing. When I look through my archives, I find many posts that I am still very proud of, but occasionally I will stumble upon posts that feel like more of an afterthought than the lead. I still love Pinterest, and Instagram, and Twitter, but I’m trying to not put so much pressure on myself with any of these communication tools, but rather appreciate them for what they are and should be: fun. Not a reason to feel pressured to live some kind of perfectly styled life because — let’s face it — none of us have that kind of time. Beautiful things should make you feel good about the world around you, and connecting with people virtually should make it feel small in a good way. I told myself before the Christmas weekend that I wouldn’t go online at all on Christmas Day but, inevitably, I did. I checked my Facebook, shared images of our gift exchange and breakfast, and scrolled through my Pinterest. It felt natural to me, and only human to want to share what we were experiencing with other like-minded people. On that day, it felt nice to connect with people, and as I looked at perfectly arranged table settings, pure white kitchen islands, and expertly styled hair in my Pinterest stream, I felt happy about everything beautiful in the world. I do think it’s possible to enjoy the ‘more’ in this world, without worrying about putting out less. I’ve noticed that, over the course of my pregnancy, I’ve put less pressure on myself to stick to a schedule. As a result, I didn’t post significantly less (though there were weeks when I only had one post and when it didn’t get published until the very end of the week), but what I did post was food and stories that I still want to revisit. I have started to put my flowers in mason jars tied in twine and bought some tassels for the baby’s nursery, and I’m thankful for Pinterest for helping me reconnect with my crafty self. And while I can sometimes feel overwhelmed by social media, by and large, it helps me feel connected to people who make me think, question, discover, and continually push myself. So here’s the thing: in 2013, I’m going to try to not plan so much. I know (or so I’ve been told) that babes don’t really care about your schedule, your big plans, and especially not your cute dry-clean only clothes. I know that Turntable Kitchen will grow with us, as it has over the past two years, and I know that it will only continue to get better for us, and for you. The stuff you’ll find here is the stuff that really matters. Whatever that may be. I wish you a safe, happy, and healthy New Year. I tweaked my favorite cinnamon roll recipe for Christmas morning, and conveniently froze the leftovers. Whether baby arrives by Jan 1st or not, I think they’ll be a nice way to start a very exciting New Year. See you on the flip side, sparkling and all. 1. Start by making the dough. Heat milk in a small pot until it just starts to bubble. Remove the pot from the heat and stir in the butter until it is melted. Set aside and let cool. 2. Combine half of the flour, yeast, sugar and salt in the bowl of a stand mixer fitted with a beater attachment. Beat until the ingredients are well-mixed. Add in the lukewarm milk/butter mixture and eggs, beating well. Add in 1/2 cup of flour, stirring well. Continue adding the flour, 1/2 cup at a time, mixing well each time. 3. Once the dough has just come together, switch to a dough hook and knead for another minute or two. Transfer dough to a lightly flour surface and knead it for another few minutes, until it is smooth and elastic. Add flour, as needed, to keep the dough from sticking to your cutting board or counter. 4. Cover the dough with a tea towel and let it rest for 10 minutes. 5. 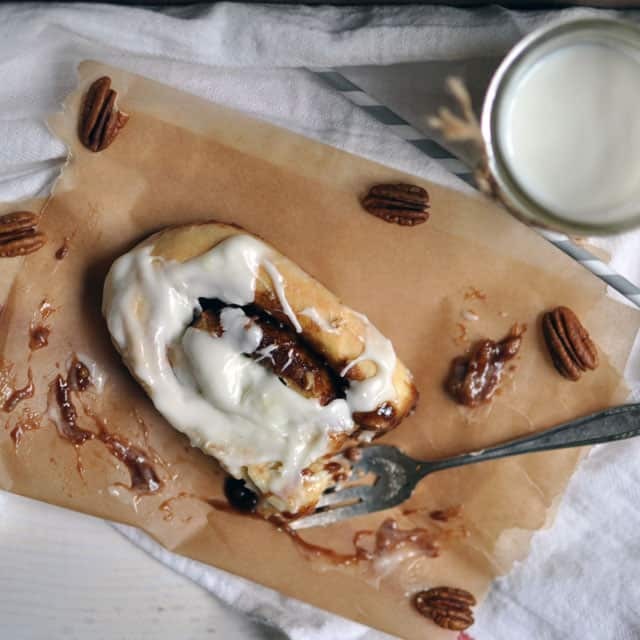 While the dough is resting, combine all of the filling ingredients (except the pecans) in a medium bowl. Use a pastry cutter to cut the butter into the sugar and spices until everything is uniformly mixed and you don’t have any large chunks remaining. 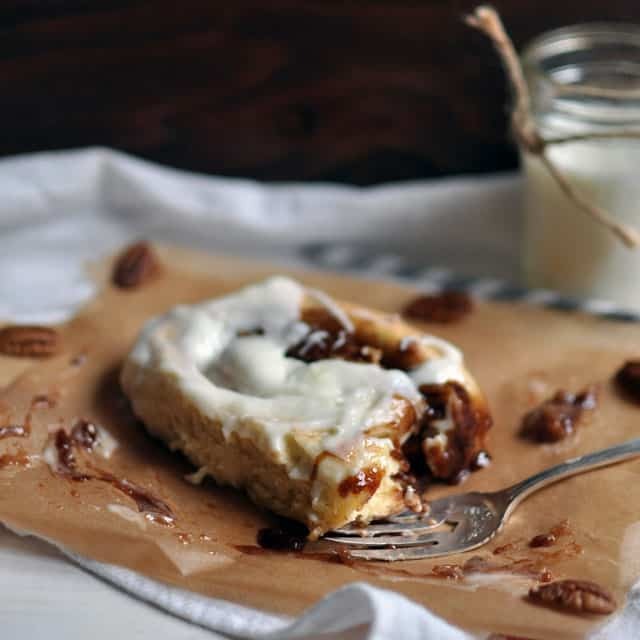 Incorporate the chopped pecans using your fingers. 6. Roll out the dough into a roughly 9×12 inch rectangle. Spread the filling evenly over the dough and roll from the long end, making sure to leave the edges bare. Seal the roll by pinching and twisting the dough along the edges. 7. Butter a 9×12 inch glass baking dish. Cut the dough log into 12 rolls, placing them cut side up in the pan (they should fit snugly against each other). Cover the pan with cellophane and refrigerate for approximately 8-12 hours. 8. Remove the pan from the refrigerator and let it sit out in a draft-free place for about 30 minutes. 9. 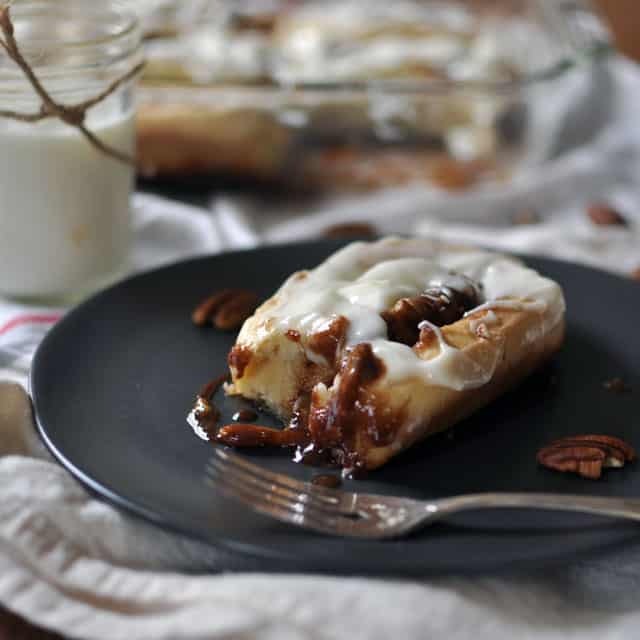 Preheat the oven to 375 degrees F. Bake the cinnamon rolls for about 20 minutes, or until they are lightly browned. 10. While the rolls are baking, prepare the frosting. Add the cream cheese and milk to the bowl of a stand mixer and beat until smooth. Next, add the sugar and beat until fully incorporated and lump-free. 11. 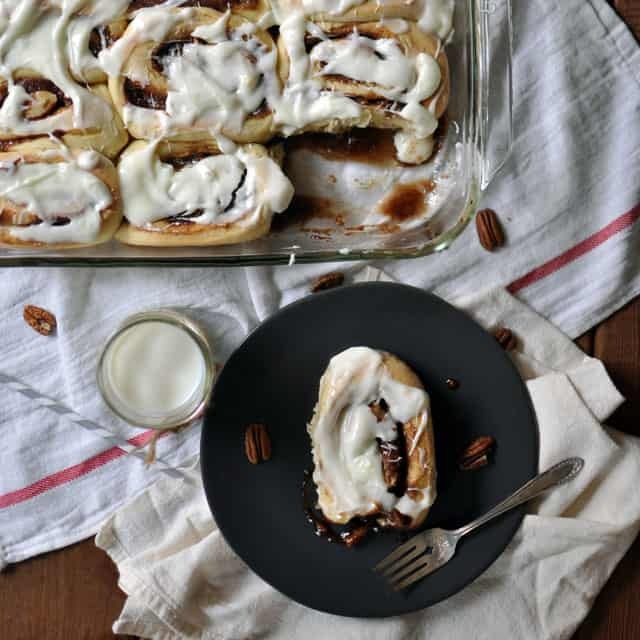 Spread the cream cheese frosting over the hot cinnamon rolls and eat warm.